For Better - Or What? : Are You Trying to Drive Me Crazy? Does your spouse do something that makes you uncomfortable, gets in your way, or just drives you crazy? She whistles while she works. He drops his underwear in the middle of the bedroom floor. 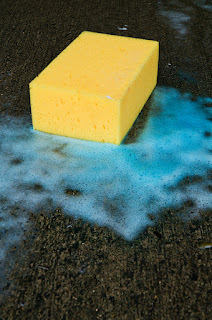 She leaves the sponge in a big puddle of water on the counter. He puts his feet up on the coffee table. She laughs so loudly at the TV that you can't hear the dialogue. He leaves the cupboard doors open. Perhaps you have suffered in silence. More likely you have mentioned the problem, nicely at first, but with increasing irritation as time goes by. Your partner knows how much this bothers you. It's pretty obvious that he is too selfish to care. It would be so easy to do the right thing, but obviously he has no respect for your feelings. If he really loved you, he would be more considerate. You may begin to wonder if he is doing this deliberately to spite you. Whoa! Before we go too far with this, perhaps we need to step back and consider it another way. The reality is, many annoying behaviors are simply habits that people have independently of whether or not they are living with someone else. Often, they aren't even fully aware of what they are doing. If your sweetheart would do whatever it is she does even if you weren't around, then it isn't about you. It's just a habit. When you realize that it isn't directed at you and has nothing to do with the way your spouse feels about you, it becomes much easier to live with. That doesn't mean you can't request a change. But if it's difficult for your spouse to change because the behavior comes so naturally to her that she doesn't even notice it, then it's silly to take it personally. At the same time, you probably have some quirks and habits that annoy or inconvenience your partner. Perhaps you've been told about them, or asked to change. Just like your spouse, you are not behaving this way out of spite. Your habits have become so normalized that you don't even see them as habits. It seems as though it's just the way you are, and you would be this way whether or not you were married. But it's worth remembering that being married isn't the same as being single. If it were, we wouldn't bother to do it! Living with another person requires some adjustments. Making an effort to increase your partner's comfort in small things is a way to show love and consideration that costs you very little. Try to treat your habits the way you wish she would treat hers, and treat hers the way you wish she would treat yours. New habits can gradually replace old ones, and eventually you won't remember doing it any other way. Your willingness to change may even inspire her to make a few changes of her own. In any case, by being more accommodating and less demanding, you will create a more relaxed atmosphere that benefits both of you. Hi Rosemary! I know I used to think that CJ was doing things on purpose. Only when I changed my life - exercised more and spent more time with CJ and less at work did I realize that it was ME that was annoying MYSELF. I was stressed and tired, so everything seemed to peeve me. Now...well, I am happy as a hippo in a mud puddle. Ooh good one. My mom used to make the joke that my dad thinks everything is a hook. The bed post, chairs, knobs--all of these could be used for his clothes. And I thought to myself, that would tick me off. Well lo and behold, my hubby is the same way!!! It bothers me sometimes but then I remember how my mother was able to refer to this same habit jokingly. Lesson of life: don't take yourself so serious:-) Thanks for linking up! I never thought my husband was doing things intentionally, but I suppose I never was doing things out of habit. I thought it fell somewhere in between if that makes any sense. The habit that annoyed me the most is that he used to leave his shoes on whenever he was home, and he’d put his feet up on things to relax or get in bed to watch TV or lay on the coach all with his shoes on. I’m not entirely disgusted but I kept thinking about anything he could have stepped on while walking on pavement, parking lots using public restrooms, etc. At first my approach was to encourage him to truly relax by taking of his shoes and rubbing his feet a little. He didn’t seem to take the hint and kept doing it, so then I started asking him to take them off, and this only worked for a little while. It's funny how worked up we can get about such little things. We all do it and when we think about it in the grand scheme of things, it's so silly and downright foolish. When we are in our final days on earth, we won't care about whether or not our spouse picked up their socks within 12 hours or if the toilet paper roll was left "over or under." What matter is we love; fully and completely. And if we do that, I think all else will matter that much less. Oh good post. I find if my husband cracks his knuckles, it makes me crazy. I'm not sure if I'm irritated by it, so much as the sound gives me shivers. He has got much better about not doing it.